As CrossFit training gets bigger and more popular this side of the pond, people will be ready to question the principles and intensity of the training. People do get injured, people do push themselves too hard and people do things they probably aren’t ready to do – but that goes for just about every sport out there! Walk in to any gym in the UK and you will see people training badly, even dangerously! Thinking about trying CrossFit or have been CrossFitting for a while? Chris Spealler, a very experienced CrossFit coach and athlete, put out a nice blog post about this recently. Made me think a bit too! Squat, squat, squat, squat… ouch. I’ve been doing regular CrossFit-type training for about six months now and have done A LOT of squats! Stiff, tired legs and DOMS are not on my Christmas card list! This seems like a good junction to talk a little bit about knee pain and one of the most common over-use type injuries, namely cartilage and meniscal issues! Cartilage is a thin, elastic tissue that protects the bone and helps joint surfaces slide easily over each other. There are two types of cartilage in the knee: articular (joint) cartilage, which covers the surfaces of the knee joints (patello-femoral and tibio-femoral); and hyaline (meniscus) cartilage, which sits in two distinct thickened, disc-like shapes within the tibio-femoral joint and essentially acts as a shock absorber providing structural integrity and spreading load. In addition the menisci have an important proprioceptive role, providing lots of functional joint stability feedback. Various factors affect how well the meniscus and cartilage function: foot/knee/hip position, stance and posture; work/sport; flexibility of the great toe; muscle imbalances; gluteal control; age; weight; other joint problems; previous injury…the list goes on. CrossFitters are generally not spring chickens and often carry previous injuries–so it is quite possible that you may have damaged your cartilage in a past knee injury from playing sports or tripping whilst drunk or maybe even dancing badly then waking up with odd bruises and swelling that you have little recollection of. These can be fairly insignificant and heal quickly. Larger trauma like fractures and tendon or ligament injuries often come with a serving of meniscal damage but may be a less significant problem at the time. However minor these injuries may seem, they add up over time. Unfortunately like any other machine, the joints of the human body are subject to wear and tear simply through the numbers of repetitions performed, and this is the main point I want to make in this blog! Just like a mechanical component, let’s say the tracking alignment of a car chassis and the effect it has on tire tread, if something is off line it will cause an unequal pattern or wear. So poor technique when doing squats, lunges, jumps, deadlifts, pistols, etc. can create that same wear on the meniscus. Over time this leads to a learned dysfunction and then inevitably to pain! StreTch, Josh, Geoff, Tom and all the other trainers consistently drill us about technique when performing complex movement. Their aim (apart from building fear and denting our pride) is that we carry on this correct form into our capacity work, strength training and most importantly into the WODs and competitions. Unfortunately when I see people with injuries, usually they can pin point the start of their problem back to an intense training session or WOD. When we fatigue, form lapses and injuries can happen. Continued poor mechanics and pain lead to further ‘shearing’ of the articular surfaces (this can go down to the bone) and meniscal tears. The menisci are relatively avascular therefore it is thought that menisci don’t repair and regenerate very well (with the exception of the outer rim) – another reason why careful attention to pain and symptoms is recommended! 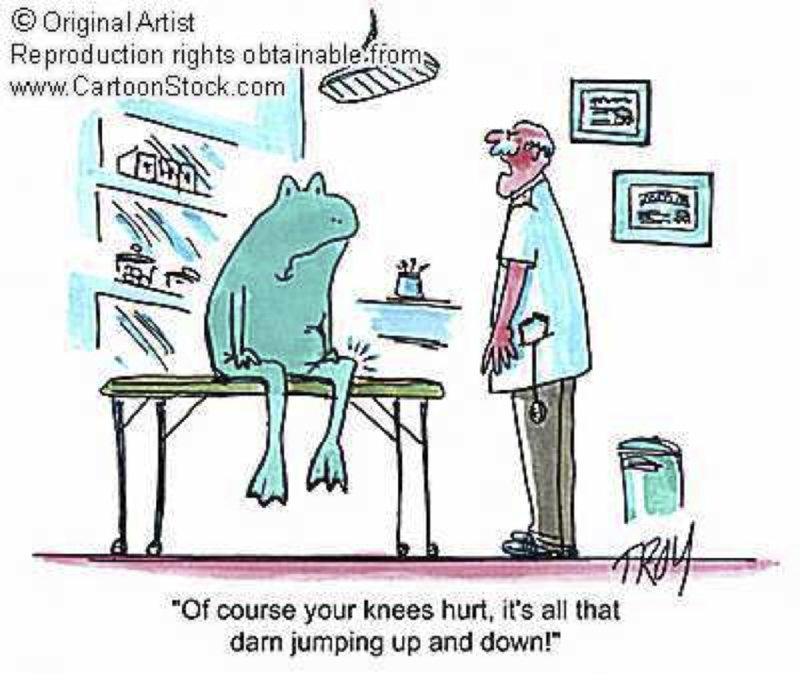 Do you have a cartilage or meniscal problem? Work out what movements/exercises cause problems. Try to correct faults and work through the full range. Talk to the coaches and get others to watch you perform movements. Don’t ‘bounce’ on your knees during movements or reps! We are all looking for a nice deep squat below 90 degrees but you must maintain muscular control through the full range. Otherwise you are just relying on recoil and momentum to bounce you back up from your heels putting extreme pressure on the ligaments and posterior horns of the menisci. These forces are magnified exponentially when you add weight! Look at your alignment with all knee movements-is left the same as right? If not, why? Wear the correct footwear! There are so many trainers out there! Do you over pronate or under pronate, and does it worsen when you squat or lunge? If you can’t correct it then consider an orthotic. Check the mobility of you hip, ankle and big toe–is there a restriction on the problem side? Check the flexibility of the main muscle groups on the affected leg – hams, quads, glutes, gastroc. and soleus. Fix this with stretches and foam rolling! If the knee is swollen, rest it. You don’t have to stop training! There are hundreds of exercises for you to do, so be smart and work around the knee. Don’t ignore it! Most musculoskeletal problems can be fixed if you get at them early – the right advice and management can save you a lot of pain, money, missed training and a meeting with an Orthopaedic Surgeon!